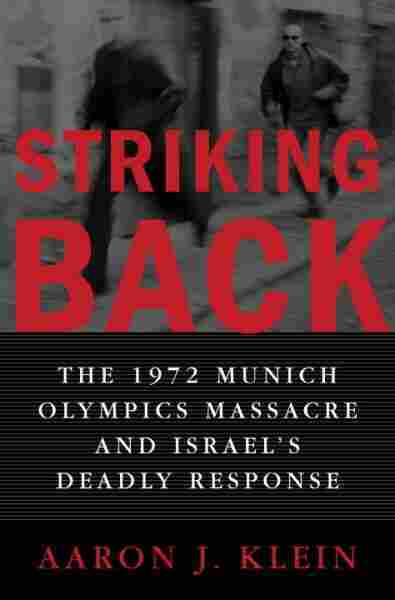 'Striking Back' Look at Munich Killings, Aftermath Aaron J. Klein talks about his new book, Striking Back: The 1972 Munich Olympics Massacre and Israel's Deadly Response. It's about the secret, 30-year campaign to track down the killers of Israeli athletes at the Munich Olympics, which was led by a secret Mossad unit, code named Caesarea. Aaron J. Klein talks about his new book, Striking Back: The 1972 Munich Olympics Massacre and Israel's Deadly Response. It's about the secret, 30-year campaign to track down the killers of Israeli athletes at the Munich Olympics, which was led by a secret Mossad unit, code named Caesarea. At the 1972 Olympic Games in Munich, Palestinian gunmen, members of a group called Black September, kidnapped and killed the members of the Israeli Olympic team. After Munich, the Israeli secret service, the Mossad, set out to kill the Palestinians responsible one by one. This is the story behind Steven Spielberg's new movie, "Munich," a story of covert action, intrigue and moral uncertainty. Unidentified Man #1: Is it Adali(ph) Ali Salameh we're after? I mean, that's the job, right? We're here to kill the guy who planned Munich. Am I right? Unidentified Man #2: It's strange, isn't it, to think of oneself as an assassin. Unidentified Man #3: Think of yourself as something else then. Unidentified Man #4: A soldier in a war. SIEGEL: What happened at Munich and its aftermath is also the subject of a non-fiction book by Aaron Klein. Mr. Klein is an Israeli journalist who covers military and intelligence affairs for Time magazine's Jerusalem bureau. He's also a reservist in Israeli intelligence. His book is called "Striking Back." The Spielberg movie and the Klein book both relate the attack on the Olympic village in similar detail, although Klein also explains the phenomenal incompetence of the German hosts of the Games. And in many key respects, they're very, very different. I spoke with Aaron Klein both about his book and also what he makes of the movie. Mr. AARON KLEIN (Author, "Striking Back"): The movie's a very well-done Hollywood production, you know, but the facts on the ground tell a different story. You know, in the beginning of the movie, it's written, it's inspired by real events. It's more than inspired; it's almost invented by the French group who's selling information. SIEGEL: Let's explain this to people who haven't seen this. In the movie and in the book "Vengeance" by the Canadian writer George Jonas, according to someone who was supposedly part of the Mossad operation, much of the information as to who was where, which Palestinian was in which city, came from a shadowy French group, a family business, completely amoral, that sold information to all sorts of people; Israelis, Palestinians, different intelligence services. That, you say, is not inspired by real life. You think that's just fiction, is what you're saying. Mr. KLEIN: It's fiction. This is totally fiction. The Mossad was not relying on anyone but themselves on gathering intelligence. Mr. KLEIN: No, I think--you know, when you're working and when you know the way intelligence organizations are working, it's really logic. They won't rely on anyone but themselves. They won't rely. They won't give these pieces of information, you know, the data that they're going to go for this guy or that terrorist to a group that they know is selling information. It's in a way even ridiculous. SIEGEL: I want to ask you a more textural question about the kinds of people who took part in these killings in Europe after Munich. The central drama of the movie, written by Tony Kushner and another screenwriter and directed by Steven Spielberg--the central drama is the deepening moral ambivalence of a Mossad agent who is involved in this. I mean, he's tormented by doubts about what he is doing. SIEGEL: Does the anguish and self-doubt and that inner torment, does it ring true to you? Does it suggest to you the people you've met or you know of who were involved in these things--or were they just totally confident of the right of what they were doing? Mr. KLEIN: I spoke and interviewed more than 50 sources, most of them ex-Mossad agents and commanders and leaders. I didn't come across with someone who had doubts. They are very proud of what they did. They are--they still see themselves as the carrier of the sword, the people who did a holy work, a holy job, in this whole apparatus of assassinations. I don't see--I didn't met with anyone who had remorse or second thoughts or--whatsoever. SIEGEL: So that doesn't ring true to you? Mr. KLEIN: No, no, no. SIEGEL: I mean, the central psychological drama of this movie doesn't ring true to you. Mr. KLEIN: No. No, no. It's a movie, but it doesn't have to relate to reality. You know, it doesn't have to be part of reality. It's good for the movies. SIEGEL: In your book, you tried to sort out the different motives that would work in the Mossad, in Israel's effort to go after Palestinian activists in Europe. To some extent, it was meting out rough justice. To some extent, it was revenge, you acknowledge to some extent. But it was also deterrence, you say. Mr. KLEIN: Yes. Deterrence is something that is very hard to measure. It's very hard to say, you know, it's working or it's not working, but it's out there. If you're--after several incidents of assassination, you are starting to create this kind of deterrence, if it's working or not--if you will ask the Israelis, they will say, `Yeah, it's working.' If you ask the Palestinians, they will say, `No, it's not working.' So it's very hard. You know, when I was asking ex-Mossad guys, you know, `You are talking about deterrence, but is it working?' and they would smile and say, `You don't know how many didn't get involved with terror because of what we did.' And so, yeah, we cannot measure it. SIEGEL: But this remains problematic in American counterterrorism, which is whenever somebody wants to defend some questionable practice that our country is doing, the United States is doing, they'll say, `Look, you don't know how many attacks didn't happen because of what we did. We've saved lives by doing this, and we've prevented things from happening. We've deterred them from happening.' I don't know which it is. Mr. KLEIN: Yeah, and it will be a question mark. We won't be able to know. SIEGEL: Well, Aaron Klein, thank you very much for telling us about the story that you report in your book, "Striking Back." Mr. KLEIN: Thank you very much. SIEGEL: Aaron Klein's book, "Striking Back," is subtitled "The 1972 Munich Olympics Massacre and Israel's Deadly Response."